VANCOUVER, B.C. — You can’t really know Canada’s vibrant and diverse western metropolis, home to 2 million busy souls including the surrounding communities, without first taking a walk through the city’s forest and down by its shores. 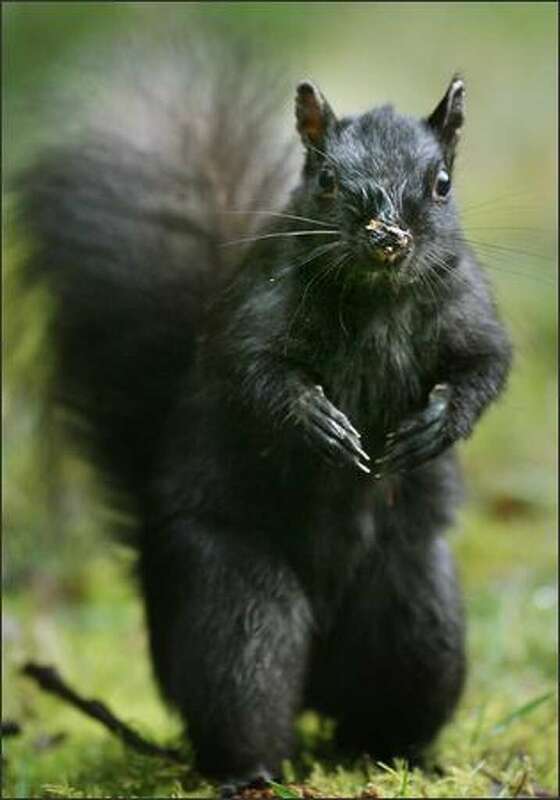 Vancouver cannot be considered — in a larger sense — without also thinking of Stanley Park, the 1,000-acre sylvan sanctuary at its doorstep that this year is 120 years old. When you ask the people of Vancouver about their perceptions of the city, a special spot is reserved for the park and its towering green forest of native conifers and captivating 5.3-mile shoreline promenade known as the Seawall. For a city park, it’s huge, but it is not the largest urban park in North America. For example, Portland’s Forest Park is more than five times as large. 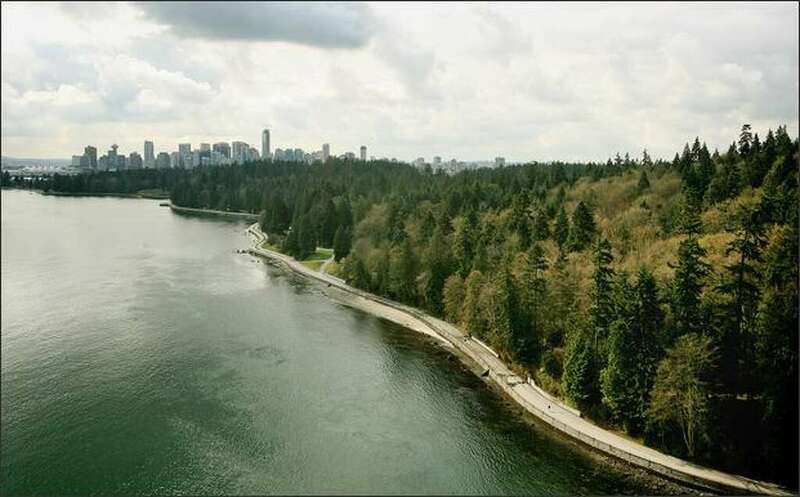 But Stanley Park is certainly one of the most magnificent, with 650 acres of mature forest smack in one of the most densely populated areas of Canada. It is often considered one of North America’s “big three,” along with Central Park in New York and Golden Gate Park in San Francisco. 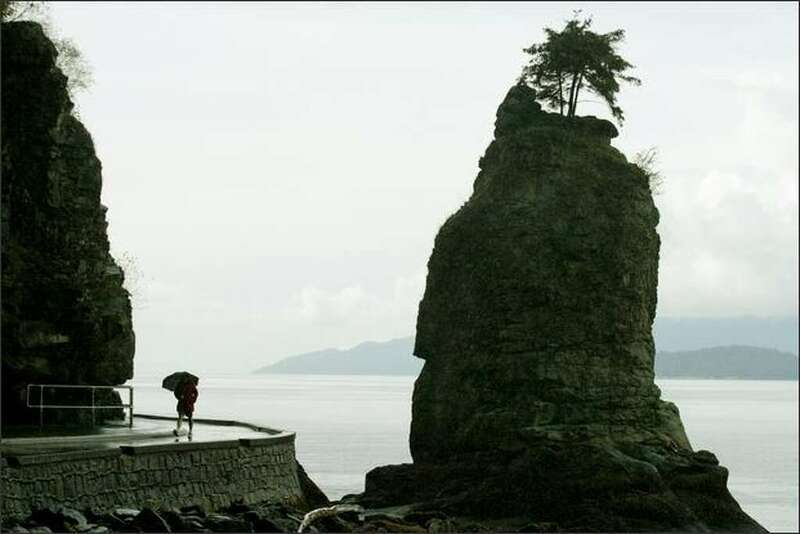 In a metropolitan area with a royal flush of parks — including majestically forested Lighthouse Park, the dizzying Capilano Suspension Bridge and Pacific Spirit Park with its scenic, clothing-optional Wreck Beach — Stanley Park is the queen of hearts. It hosts about eight million visitors every year. Two million people annually walk, jog, run, bicycle or skate the Seawall, which edges the peninsula that serves as the park’s pedestal, jutting out into the sea as it does with Burrard Inlet on the starboard and the Strait of Georgia to port. Its two entrances, along Beach Avenue on the south and Georgia Street on the north, are busy, busy places on any given day. But walk, run or ride out to its outer edge around the Seawall sea stack called Siwash Rock and, though you’re scarcely more than a mile from the downtown core as the eagle flies — and eagles fly here relentlessly — you’ll feel a whole world away. You get the same feeling deep in the old forest of Douglas fir, red cedar and western hemlock while walking along the park’s almost 17-mile network of interior trails. Here one recent day we meet Paul Sherstobitoff taking pictures of a morning mist drifting over marshy Beaver Lake. People have been coming to this place for at least 8,000 years. The Squamish people maintained summer camps on the peninsula, and the tangible evidence of this can still be seen in the crushed clamshell surface in places along the base of the Seawall. These are the remains of shell heaps, or “middens,” that in spots were 8 feet deep before the park was created and the Seawall built. Stanley Park was created by the first resolution of the fledgling Vancouver city council in 1886. It officially opened in September 1888 and was dedicated the next year by its namesake, the governor general of Canada, Sir Frederick Arthur Stanley. Today the park includes five restaurants, an aquarium, a kids’ farmyard zoo, putt-putt golf, tennis courts, gardens, swimming beaches, a miniature railway, seasonal horse-drawn trams and shuttle buses, playgrounds, a kids’ water park, athletic fields for lawn bowling and cricket, picnic sites, a pool, a totem pole display and more monuments, memorials and statues than you could shake a cedar bough at. For most people, the most stunning aspects of the park are the old forest and the sea. At first glance you might think the forest is all old-growth, since the sea-breeze-swept treetops are tall enough to tickle the often misty skies, and many ancient specimens do survive. But most of this peninsula was logged from the 1860s to the 1880s. The loggers left much of the less-valued hemlock, as well as a dozen huge Douglas fir and western red cedar that were deemed impractical to cut. What is amazing is that this forest still appears stately and imposing after being pounded and pummeled by the fierce storm in December 2006 that swept across the Pacific Northwest. Stanley Park lost an estimated 10,000 trees in that blow. Not all the downed trees were left on the ground. Last month a restoration effort was completed, with much of the downed timber removed and new trees planted. Many of the dead trees were removed because of concerns about fire hazards, and not just concerns about naturally caused fires. Although you usually don’t see them, homeless people live in these forests. On a bird-watching walk conducted by the ecological society and led by Worcester, we met Yolanda Perez, who visits the park almost every day. Park managers appear to maintain a policy of tolerance. It is not advisable to leave anything of value in your car when parked at Stanley Park — or anywhere in Vancouver, for that matter, particularly if your license plates identify you as a tourist. But those who frequently visit the park say it is a very safe place. Perez, a Spanish language teacher, says Stanley Park keeps her healthy — physically and spiritually. At the same time, while Stanley Park might be Vancouver’s crown jewel, it is not its only gem. 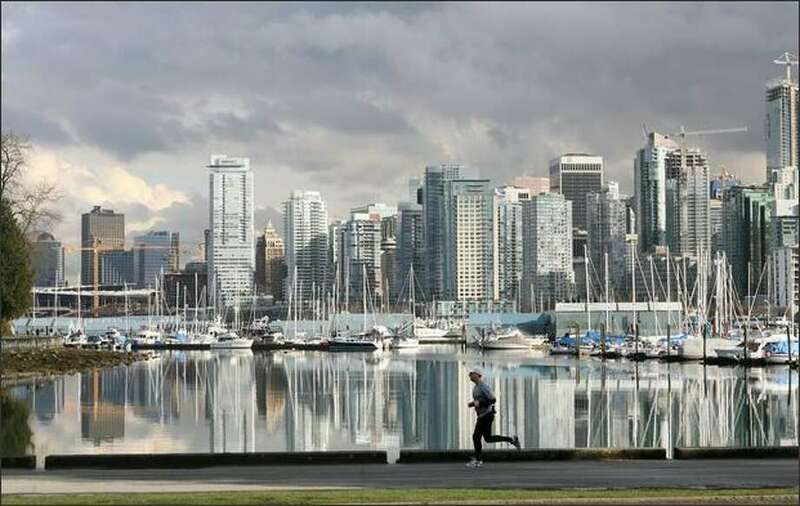 The Seawall, for example, defines Stanley Park for 5.3 miles but also wraps around the rest of the city for another 8.6 miles, with other parks along the way. One of the pearls — English Bay Beach, near the southern entrance to Stanley Park at the south end of Denman Street — was positively glowing one evening we were there. Here, next to a beautiful bronze and granite sculpture called Sundial, we watched a crimson-flaming sun settle into the Strait of Georgia. The next park south along the Seawall is Sunset Beach, another fine spot to witness the passing of another day. And there are other terrific parks farther afield, yet still within the limits of greater Vancouver. We had fully intended to explore several, but Stanley Park proved so large and intriguing we had time for just one other, Lighthouse Park in West Vancouver. It was pouring when we arrived, but we put on our rain gear and headed down the Beacon Lane Trail (a gravel road actually) through a towering forest of cedar and fir to the picturesque Point Atkinson Lighthouse. Here we clambered around the shoreline rocks — caution is advised — looked back toward Stanley Park across Burrard Inlet and watched several bald eagles flying low overhead. Then we followed the Valley Trail, a real trail, in real old-growth forest, back to the car. This 160-acre park, almost all old forest, is busy and popular, but definitely worth exploring, with plenty of shoreline spots for picnicking, navel contemplation and just gazing. Another park in “West Van” on my someday-must-visit list is 32-acre Cypress Falls Park, in old-growth forest with pretty waterfalls. And to the east is the tourist favorite Capilano Suspension Bridge, a privately owned park with an admission fee ($27 Canadian; ouch!) that features a 450-foot-long footbridge 230 feet above the Capilano River. Finally, huge Pacific Spirit Regional Park wraps around the University of British Columbia campus, south and west of downtown. It offers 32 miles of trails and several miles of saltwater shoreline that constitute, it is said, one of the largest skin-friendly beaches in the world. If your goal is to know Vancouver intimately, how can you not go there?